Choreographer Holly Small and Composer Robert W. Stevenson jumped at the chance to recreate their 1981 collaboration Cheap Sunglasses for DanceWorks 40th Anniversary Celebration. Cheap Sunglasses, a work for solo dancer and four vocalists, premiered 36 years ago in DanceWorks 21. Composer Robert W. Stevenson took a line from a Z Z Top song as his point of departure and commissioned choreographer Holly Small to create a dance to accompany his music. Responding to the rhythmic challenge of Stevenson’s score, Small explored the singular movement style of an earlier pop idol — Elvis Presley — to devise the edgy, boyish movement quality she was after. Originally danced by Small with vocalists Stevenson, Michael J. Baker, Miguel Frasconi and Andrew Timar, this brand new version will feature a gender reversal, with dazzling newcomer Evan Winther dancing Small’s choreography and four superb female vocalists, Jocelyn Barth, Mingjia Chen, Bea Labikova and Laura Swankey, performing Stevenson’s rambunctious vocal score. Aparadiant speculates on the enigmatic bond between two souls re-united in a possible after-life.The piece began as a brief solo and duet created with Jessica Runge and Michael Caldwell for Radiant (2009). Subsequently it was developed through three phases in collaboration with Jessica, Michael, Sean Ling and Brendan Wyatt and has been presented by Vancouver Dances for a Small Stage (2014), Toronto Heritage Dance Foundation (2015) and the MFA Program, York University Department of Dance (2016). In this ambitious work, Holly Small is drawn to investigate notions of death and speculate on a possible afterlife. Presented in partnership with Quebec City's Recto Verso and Méduse and Toronto's princess productions, dance: made in canada/fait au canada, Radiant is a compelling and unusual inter-disciplinary work featuring powerful performances by a cast of Toronto's finest dancers and musicians along with inter-active sound and images created by a collaborative team of seasoned innovators from Ontario and Quebec. Radiant was nominated for Dora Awards in all four categories — outstanding choreography, music, performance and production. —playing fast and loose with The Sirens from James Joyce' Ullysses, we speculate on life after drowning. — meanwhile, deep in the forests of Northern Ontario, savage maidens offer ritual dances to summon Spring back to our frozen land. Rite Redux is an audacious re-imagining of Le Sacre du printemps created to celebrate the 100th Anniversary of the 1913 Stravinsky/Nijinsky milestone that shocked Parisian society and heralded the dawn of the Modern Era. 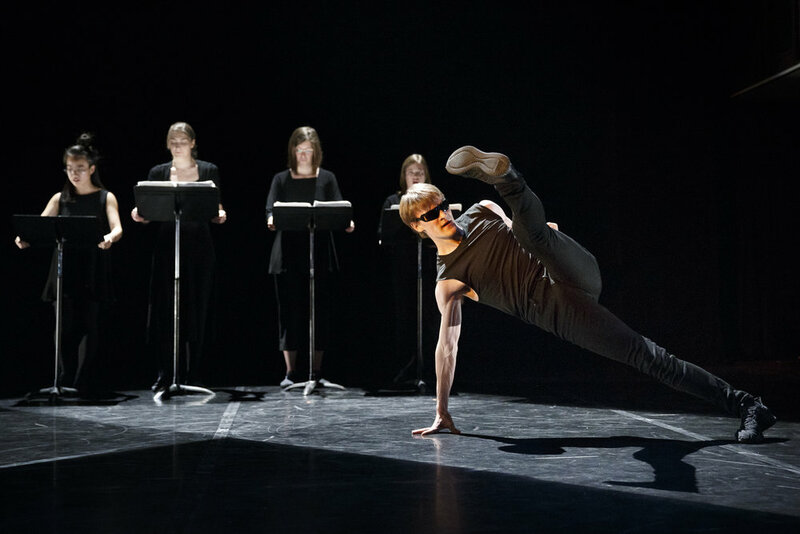 Directed by Holly Small and devised by an impressive team of seasoned artists, Rite Redux brims with the exuberant energy of the young dancers of the York Dance Ensemble. At the same time, the work reflects its creators’ identities as mature artists with deep roots in Canada. Seeking to invent a unique canvass of expression for this oft-interpreted music, we shifted the setting from pagan Russia to the wilds of Northern Ontario; landscapes that inspired Tom Thompson and the Group of Seven, landscapes that evoke the spiritual forces contained in nature. The title Rite Redux (from the Latin) contains the idea of “resurgence”— primal energy thrusting upward, the frozen earth thawing and cracking open with the coming of Spring, nature re-surfacing in all its savage glory. The paintings of the Group of Seven capture this turbulent vitality in a quintessentially Canadian way. Our dancers, in their threadbare flannel shirts and scuffed boots, could be the feral descendants of a gang of tree planters lost in the untamed reaches of Northern Ontario circa 1969. Their wild nature tunes itself to Stravinsky’s spectacular music; they are more hawk, wolf or deer than human. In Just Spring… developed over six months of experimentation with collaborative creation of music and dance. Initially inspired by the early 20th century poem “in Just-“ by e.e.cummings, we played with an array of source materials and improvisational strategies. The piece runs the gamut from completely free to highly structured improvisation. Towards the middle, eight dancers detour into three minutes of choreography from Holly Small’s Fabulous Stupid; all other material is devised by the dancers and musicians of the York Dance Ensemble 2012/13. Suddenly Everyone… developed out of intensive research into music/dance collaboration with the York Dance Ensemble 2011/12. We devised myriad structured and free improvisations drawing on an array of source materials. We explored diverse imagery and text. We experimented with voice, space, weight and time. We investigated traditional improvisation techniques such as “lead, follow, imitate, accompany”, devised new compositional scores and games; and time and again we returned to the elements earth, water, fire and air for inspiration. This work, set to three sublime piano pieces by James Tenney performed by Casey Sokol, celebrates the expressive power and tenderness and beauty of the dancers for whom and with whom it was choreographed. Created in memory of Darell Small (1915-2008). Originally commissioned in 2008 for Ryerson Dances; re-invented in 2012 for York Dance Ensemble. Set to Wes Wragget’s haunting score for accordion and tape, Quartet for Cannibals is a choreographic interpretation of ideas and images from the work of Susan Sontag, particularly her book Illness as Metaphor. Working with four extraordinary dancers (Wendy Chiles, Roberta Mohler, Claudia Moore, Jeannie Teillet) I investigated the pathology, sociology and mythology of four diseases, each emblematic of its era: hysteria, cholera, consumption, and cancer. Together we created a dark and strange dance with currents of absurd humour flowing throughout. Initially presented in a festival of 10 Toronto Independent Choreographers produced by Pavlychenko Studio (Kathryn Brown & Susan Cash, Artistic Directors), Quartet for Cannibals was a favourite with audiences and critics. Also in this historic festival at Nathan Cohen Theatre, YPT, were Anna Blewchamp, Kathryn Brown, Susan Cash, Murrary Darroch, Nancy Ferguson, Gabby Micelli (Kamino), Susan McNaughton, Claudia Moore and David Wood.